We strive to create fun, functional products that both children and parents will enjoy using over and over again. Bright, colorful designs featuring contemporary prints and favorite characters help get kids on board, while parents are sold on the quality and durability. 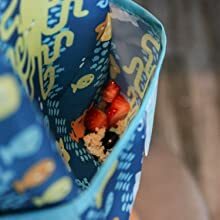 We pride ourselves on helping to keep products out of the landfills and keep money in parents’ pockets. 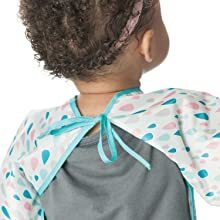 Bumkins Sleeved Bib saves one outfit at a time with the award-winning protection of Bumkins’ lightweight, easy wipe, machine washable waterproof fabric. Generously sized, comfortable and durable, the Sleeved Bib is great at containing spills and reducing laundry. Bumkins Sleeved Bibs feature elasticized cuffs for an adjustable sleeve length and back tie closure for a comfortable and custom fit. 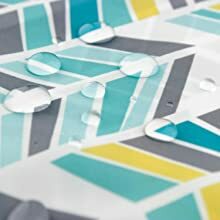 Bumkins' signature fabric is 100% polyester with a waterproof coating embedded into the fabric. Our bibs are lightweight and easy wipe, making them both comfortable and durable. 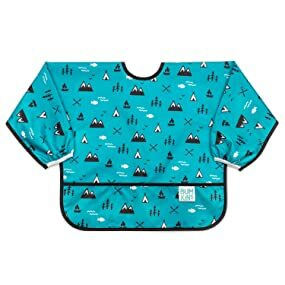 With a generously sized, catch-all pocket, Bumkins Sleeved Bibs are great at containing spills and reducing loads of laundry. Bumkins bibs are designed to withstand wash after wash. 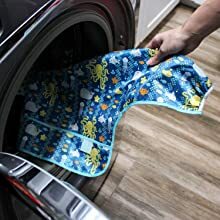 Simply machine wash warm and hang dry thoroughly before storing.